Are You Ready To Follow The Path of The Holistic Medicine Detective? You Are Ready To Follow That Path, If You Answer "Yes" To One Or More Of These Questions! Have you realized that taking Pharmaceutical Medication is not making you any healthier, even if it does benefit some symptom you have? Has your health ever been damaged by Pharmaceutical Drugs or Surgery? Or, have you seen someone you cared about so damaged? Have you come to the realization that what you eat, drink or take in pill form or inhale or put on your skin has to have an effect on your body and its health? Have you ever experienced bad side-effects of over-the-counter or prescribed pharmaceutical drugs? Would you like to be healthier...not just a little healthier, but a lot healthier! Would you like to reduce your current expenditures for health care? Would you like to eat and drink yourself to good health? This may sound like a joke, but it is not. Any "yes" answers? If so, let's go! You have established that you have strong enough motivation to begin training as a Holistic Medicine Detective. Let's Establish The Rest Of Your Credentials! Do You Have What It Takes To Follow On The Path Of The Holistic Medicine Detective? Are you curious about the world? When you were a kid, did you ever read Sherlock Holmes or Nancy Drew books or watch Sherlock Holmes movies? What about now that you are grown up? If you just love to explore a good mystery and are interested in health issues, this is the key credential you need to become a successful Holistic Medicine Detective. You have to love mystery and love discovering the truth and acting on the truth you have found for yourself. Including learning how to treat yourself well (this double meaning is intentional) and by doing so improve your health. Now my focus isn't going to be on making you laugh...there are other places where you can go to do that...So, I'll resign myself to mostly teaching you key things about your body that you need to know and also what you can do to improve your health. All really great detectives have a sense of humor. You don't have to become a great Holistic Medicine Detective, so you don't have to have a great sense of humor, but when you are sick or not feeling well it helps so much to maintain a healthy sense of humor. If you are determined and committed enough, I'll teach you what you need to know. The two of us will work together. Together, not seeking to find out who committed crimes and bringing them to justice, but to discover significant health truths which you can implement your self or which you can access that actually work. Let's call this case "The Mysterious Case of How Can I Improve My Own Health". We can also work to solve the case of "The Mystery of Way Too Much Sickness and Death By Medicine." I promise you, you will be great! You will discover what a good team of Medical Detectives we can be. And, you will find the Holistic Medicine, Traditional Chinese Medicine and Natural Health solutions you seek to your health concerns. Finally, you will have valuable information to share with others you care about...talk about being a hero! Here is what I propose that we do...together. One approach I will take is to teach you about healthy foods and unhealthy or bad foods. I will teach you about the powerful healing properties that many foods share with herbal medicines. I will teach you about how to juice fruits and vegetables for maximum nutritional intake...so you can throw your artificial vitamins and other supplements away and by doing so save a lot of money and improve your health at the same time. How great is that? I will teach you about some common degenerative diseases and what you can do to reverse them altogether. A little later in the development of this site after I have set the ground and foundation of your knowledge and understanding...then...I will describe a set of symptoms which may include those you have or that someone you care about has. I'll give you the category, say Gall Bladder, so you can make the link of possible symptoms to the affected organ. I will set the stage, scene, cast of characters, introduce the plot, make clear the issues in the words of the actual people who came to me for help. We will speculate and collaborate together on what the probable causes could be. I will report to you what my patient's mainstream doctors said was the cause, and what they did to treat the problem and what the results were. 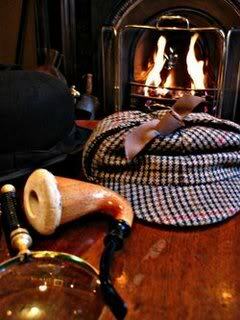 Just as Sherlock Holmes and Dr. Watson had only their wits and brains and experience to work with...They had only the tried and true...while the evildoers had "new ideas, science, technology and genius the world had never before seen" on their side. You and I will be bringing our... no doubt...according to "them"...paltry intellects. Not to mention using ancient healing knowledge and wisdom that is judged by "conventional wisdom" and "modern experts" as being far inferior compared to the best answers, logic and reason and treatments that modern medicine, Allopathic Medicine's drugs and or surgery medicine seems to offer. Yes, you and I will be up against the best and brightest medical and scientific minds of our time. Hey, who are "they" anyway? Are you willing to pit your human ability to think and reason, to explore, to investigate, to analyze and evaluate against the greatest minds of modern science and medicine? "Set loose the hounds and let the games begin..."
Let's Begin Your Training And Education. Step 1. What Is Holistic Medicine? You can't do anything in life if you don't know what you are doing and why you are doing it, can you? So let's begin with learning just what Holistic Medicine is. When you click on this link you will open a new page that will provide you with all the information you need to begin improving your own health. I will include these images beneath this test at the bottom of every page to show you where you click to go to the next step of your Holistic Medicine Detective education and training.